It’s 9 o’clock in the morning on a Saturday in the Penken Park in Mayrhofen. Snow is glittering in the first sunbeams of the day and the newly shaped park is waiting for its first visitors. Suddenly, a wild bunch of 50 girls appears on the horizon – among them local rider Nadine Cassar. This can only mean one thing: It’s Girls Shred Session today! The third Girls Shred Session in the Penken Park Mayrhofen has once more given proof of how many female riders there actually are and shown that freestyle can’t be considered a men’s sport anymore. All 50 girls followed the invitation for a common coaching session and gathered in the Penken Park on February 17, 2018. They were coached by local rider Nadine Cassar. All the girls were highly motivated and one could see their shred skills improving from hour to hour. After a successful morning, the girls took a lunch break at Grillhof Alm, where they talked eagerly about the past few hours. However, the break wouldn’t take too long, as everyone wanted to seize the remainder of the day for shredding. The afternoon was all about progression and every rider got to learn something new. They were rewarded with goodies by Mayrhofner Bergbahnen, NIKITA, Golden Ride and QParks for their efforts. 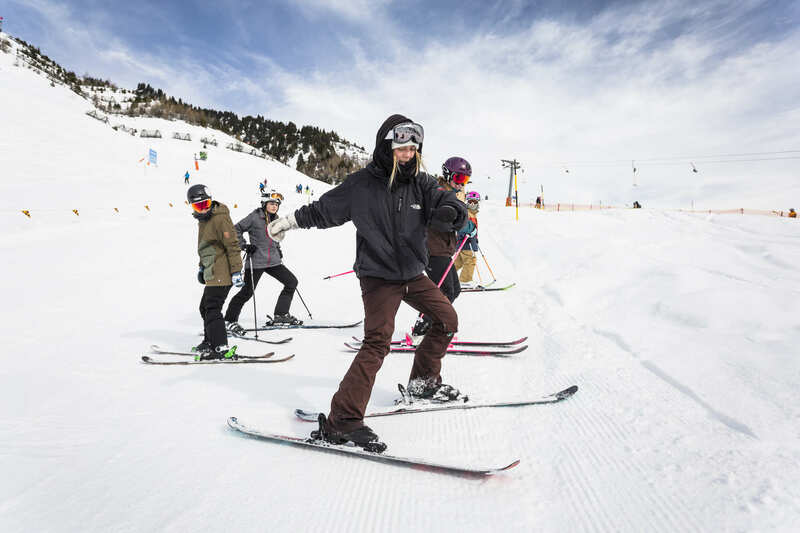 Additionally, the girls were accompanied the whole day by a media crew – thus they now have also access to cool freeski edits from their newly learned tricks! But the girls received even more, namely new shred-buddies: “I got to know so many awesome new girls. We instantly agreed upon participating in the other sessions”, Gesa Temmen from Munich comments. In the end, there were also two birthday children who wanted to be celebrated properly. First one was the Penken Park celebrating its 20th anniversary this winter. Second jubilee: QParks, the quality snowparks just became 15 this winter season. Reason enough for a delicious chocolate cake being served to all participants! For more information and updates about the Girls Shred Sessions visit their Facebook page or Instagram channel. For more detailed information about all sessions visit www.girlsshredsessions.com!